Sometimes, especially if you’re like me, you’ll be on a roll when it comes to work, perhaps figuring out a program you’re working on, when you suddenly get interrupted. And just like that, your mental focus is gone. What were you doing? You’ll figure that out after a few minutes. Notifications can sometimes be that interruption. Sure, it may be cool to have your iPhone docked next to your computer. But if the constant comments on Facebook are distracting you, is that a good thing to keep in sight? The better question: are you in control of your device, or is it in control of you? While I’m not one to disable all of my notifications1, as some have done, earlier this week I started disabling notifications that I had set up for some time. In particular, anything with a social element has been muted. My iPhone and iPad no longer have permission to display notifications, play sounds, or show a badge icon. In short, if I want to know what’s going on there, I’ll find out when I manually check those platforms. Even if you’re a heavy Twitter user, is there any reason why you need to be disturbed with every mention? Is something so urgent that a social media message should disrupt your life? I’m doing my best to say no to those questions. My iOS devices are useful. To me. They respond to what I want to use them for. And that’s how this relationship will stay. I’ve had JoshsPadd.com for over 10 years. This WordPress site has been up for over six. Yet, I always felt like I wasn’t writing as much as I wanted to. The very thought of writing can be intimating when you feel you have a lot you want to say. For instance, I recently completed our birth story post. I had started on it shortly after the birth of our son. But as time went on, it kept getting put off. The idea of being thorough with what I was writing held me off from just sitting down and finishing it. Would I miss something vital? Would people like what I had completed? That last thought is something that I also struggle with when I’m developing apps. Sometimes I get so caught up in making things just right that I don’t release an update as quickly as I could. But sometimes, you just need to sit down and go through with something and deal with any missed details later. The advantage of digital work: it can always be touched up. Now that we have seen the new iPhones, my thoughts have started to move ahead to the next likely update: iPads. Typically updated on a yearly cycle, the iPad has continued to receive refinements that continue to perfect the device. On the new iPhone 6, due to the larger screen size, Apple introduced something called “Reachability“. By double-pressing (not clicking) the home button, the top half of the screen moves down to within range of the user’s thumb. This is only possible due to the Touch ID sensor, which can respond simply by a finger being on the home button yet not clicking it. There aren’t a lot of rumors flying around Apple’s plans for 2015 yet, especially since everyone is busy with iPhone and iPad leaks. But there were two things that I’ve seen that make me think there will be an Apple event sometime this spring. First, there are the constant rumors about an Apple wearable. Is it ready? Will it launch with a new iPhone? If so, why haven’t we seen any leaks yet? All of those questions keep getting asked each and every week. But because we haven’t seen anything, some feel that we’ll see it launch in early 2015 instead. But that’s not my main reason for this prediction. Instead, it has to do with Apple’s new Photos app for OS X. Photos for OS X won’t launch until early 2015. I don’t think they would launch something like this without mentioning it at an Apple event, especially as it will replace two big name applications: iPhoto and Aperture. I expect some kind of event in March/April 2015. Apple will do its usual updates, then talk about software and the Mac, release Photos for OS X, and then go into whatever their main event is about. With 2013 behind us, I thought it was time to take a look at what Apple released (in terms of iOS) and what I think Apple will do in 2014. The first half of 2013 was very quiet with regards to Apple events. Our first public event was WWDC in June, where we finally got a glimpse at what Apple was working on in the software category. After six years of the iPhone, iOS was getting a major facelift, giving a fresh look to one of the most popular mobile operating systems. While supporting older devices like the iPhone 4 would support iOS 7, it was definitely meant to bring in a new future for Apple’s iOS devices. In the fall, we finally started seeing some hardware, with the announcement of two new iPhones: the iPhone 5c and iPhone 5s. The 5c was essentially last year’s iPhone 5 but with new, colorful shells. For those upgrading from an iPhone 4 or earlier, they made an attractive alternative to the otherwise sleek but relatively-basic colors of the 5 and 5s. The 5s, meanwhile, brought a future-thinking iPhone to the market, introducing a 64-bit A7 processor to the iOS line up. Even now, I think people take 64-bit for granted on their computers. Having that power in a mobile device is incredible. The iPad upgrades followed suit with the iPhone and received the new A7 chip, as well as other changes. The iPad was redesigned into the iPad Air, a lightweight tablet that, to me, seems like an ideal size and weight for a “full size” iPad (and is much improved over the first generation). The iPad Mini, meanwhile, was upgraded with a Retina display. I’d say the new iPad Mini is probably the best 7.9″ tablet out there. Honestly, every time I see an iPad mini, I feel like I’m living in a Star Trek world. All of these updates seemed to make the iOS device line up even better than before. What changes could possibly come in 2014? For one, I think we’re looking at the end of an old friend. The 30-pin connector has existed for over a decade and been a staple of iPods, iPhones, and iPads for years. Since the introduction of the iPhone 5 and the Lightning connector, however, it has become clear that a new era of connecting cables was at hand. The Lightning connector’s smaller size let Apple make the iPhone even thinner than previous generations. Given Apple’s typical quest to shrink things down, it makes sense that future devices stick to the Lightning cable. What had not surprised me during the iPhone event was the presence of the iPhone 4S on the lineup. Typically, the phone from two years prior would be made free on contract, and this held true. But as we look ahead to 2014, if this pattern continues, we’ll see the iPhone 4S drop off of the lineup. This doesn’t just affect the iPhone, however. The iPad 2 has somehow held on to life, despite the fact that it is three generations older than the newest iPad model available. If the iPhone 4S does indeed get retired, then the iPad 2 would be the only device still using the 30-pin connector. But, that’s not all; The iPad 2 is one of only two iOS devices sold without a Retina display. The other? The original iPad Mini, which shared many specs of the iPad 2. When new iPads are announced, I don’t think Apple wants to present a non-Retina screen as an option anymore. It’s time to look to the future and keep all devices top of the line. So, that being said, what will we see? iPhone: Since the original iPhone in 2007, there has always been at least one new phone released each year. There’s no reason for Apple not to continue. Given their introduction of two new handsets in 2013, it’s possible we’ll see two more in 2014: one a high-end upgrade of the iPhone 5s with a brand new design, a new A8 processor, and other improved specs; the other could be an upgrade to the iPhone 5c, bringing the power of the 5s into a design and feel that could appeal to the more colorful (or those that miss the feel of the iPhone 3G/S). Even if the 5c isn’t updated, I foresee it remaining on the lineup. Lineup Prediction: A new iPhone (6? ), reduced price iPhone 5s, and a colorful iPhone 5c (or update to it). 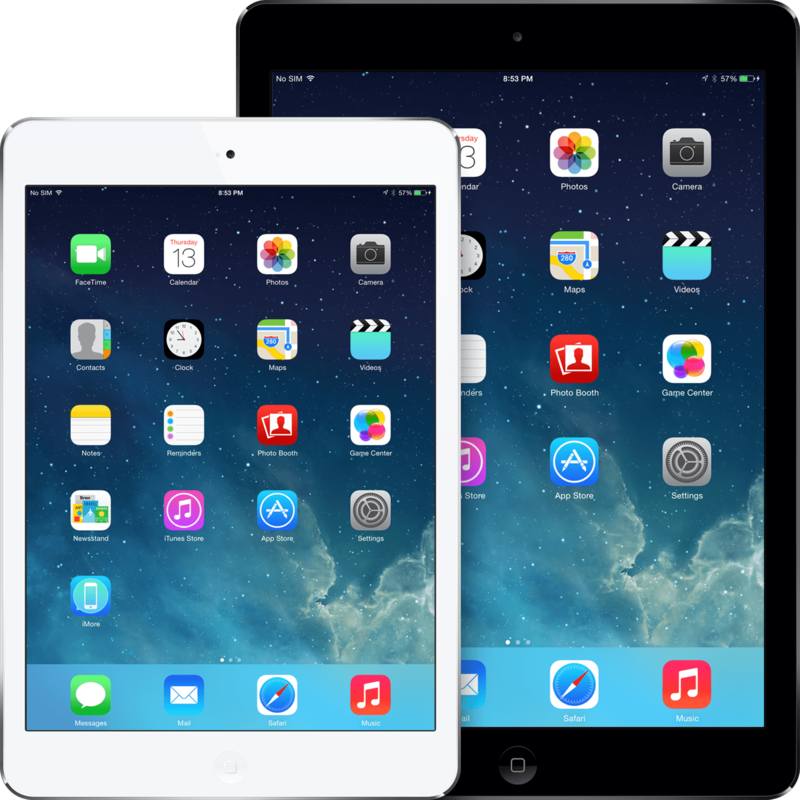 iPad: The iPad Air and the iPad Mini with Retina will see some minor changes. Both would likely see a new generation with an A8 processor and the inclusion of Touch ID, something that they didn’t receive with the previous updates. With 2 generations of iPad Mini with Retina, it could be possible for Apple to phase out non-Retina screens in their entirety. At last, we would see an end to the iPad 2. Lineup Prediction: iPad Air (2nd Gen), iPad Mini with Retina (2nd Gen), and reduced price iPad Air and iPad Mini with Retina (both 1st Gen). What about the iPod Touch? It was last updated along with the iPhone 5. Has Apple left it out to dry? We’ll have to wait and see. I wouldn’t be surprised if we see a new iPod Touch modeled alongside a new iPhone design. But the iPod line is no longer Apple’s main money-maker, so who knows what they’ll do? Rumors continue to circulate about Apple entering the wearable category or taking on the TV market further. Apple TV runs a modified form of iOS, but I won’t talk about it in this post. And with no official word about any iWatch, we don’t know what software it will run. Do I think we’ll see at least one of these in 2014? Definitely. In short, these updates may not seem too revolutionary. In a way, they’re aren’t. But they also are leading the way towards a new age of iOS devices, moving away from legacy solutions and early-tech. Having every iOS device for sale containing the new Lightning connector and a Retina display will put Apple in a strong position with premium devices. They only sell their best, and in 2014, they’ll show it. For some time, there has been some talk about where near-field communication (NFC) might be going. If it is to take off, many people see it as something that people will use to pay on the go. Want to buy that cup of coffee? Purchase office supplies? Pay for your gas? Just swipe your phone. While several companies are working on ways to do NFC payments, I don’t know if that is where NFC might take off initially. As noted in two articles I read [here and here], the option for NFC payments as a replacement for other payment forms isn’t the key. Rather, it is the features on top of that which will convince consumers and merchants to participate. Where I think this could see some use is in marketing. More and more companies are putting themselves on Facebook, Twitter, LinkedIn, and Foursquare, among other servers. Some businesses even have stickers and banners telling their customers that they are on these networks and services, too. So why not link up NFC technology with these services? Let’s say I want to check in to a store I enter. All I would have to do is swipe my phone near their (let’s say) Foursquare banner. My phone would bring up a dialogue asking if I want to check in or not. With one tap on the screen, I’ve checked in. The same could be done for any number of things. Do I want to like their Facebook page? Do I want to connect via LinkedIn? Do I want to follow their Twitter account? If those options could be given to me with the swipe of my phone, I would be able to easily keep up with that business online. If this business is using social media or location based services to offer promotions and deals or to stay in touch with their customer-base, this would be an easy way for their customers to take part and stay in touch. Or let’s say I go into a deli but have no idea what I want. Why not let me swipe my phone and link me to a menu that I can read for myself? I wouldn’t have to bring up any QRCode app to scan/photograph a code. In short, there are many options that can be explored with this technology. Will it see wide acceptance? Probably not for a while. Will mobile NFC payments take off? No way to know. But payments aren’t the only option for this technology, and there are many avenues that can be taken with it. Personally, I would rather use NFC for this type of ability than payments. If someone were to steal my phone, I wouldn’t want them to be able to pay for things with it. But I would be perfectly okay with them checking me into Foursquare. The New Doctor Who: New Foreshadowing? Alert! This post will contain spoilers! Beware of what is below! So, I know I have yet to talk about the new Doctor Who episodes, starring Matt Smith and Karen Gillan, but I thought I would already post some ideas about possible themes that I have caught in the first two episodes of season five (that is, “The Eleventh Hour” and “The Beast Below”). Zero – “The Eleventh Hour” dealt with an alien named ‘Prisoner Zero’. Obviously, the concept of zero was important in that episode. However, in “The Beast Below”, I heard zero mentioned at least once, making me wonder if this was an element worth keeping track of. Silence is Falling – The alien in “The Eleventh Hour” said that silence is falling. What does this mean? I’m not sure right now, but I think this may be something that comes up again, if not in the season finale, then during another episode in the season. A Crack in the Universe – This one is blatantly obvious in the new season so far. When we first meet Amelia Pond, she has a crack in her wall. We later see that crack on a monitor in the TARDIS before the Doctor and Amy disappear. We then see this crack on the side of the ship in “The Beast Below”. Clearly, this is some kind of obvious foreshadowing (or a red herring). In either case, it is blatant in these episodes. As we see more of the new Doctor Who season airing, we’ll see what else comes along. If you have noticed some more trends, please post them below! I haven’t blogged in a while, but I can assure you that the ideas have been floating around! So, what can you expect to see? As I was asked one or two months ago, I’m going to begin a series of posts about the internet, various aspects of it, and ways that you can use it. I’ll also point out potential dangers, as well as showing how you can protect yourself from those dangers. I’ve also got some posts ready to go with regards to Apple. Those posts will be out once I finish with a few certain things. Is there a topic that you would like me to write about? Post it as a comment to this article! I’ve been asked by several people to put together this article. As such, if you would like to contribute to it, suggest improvements or changes, or even write a similar article for me to post, leave a comment and let me know! So, you got yourself a Twitter account. It is the big craze, after all! But you’re not sure about all of the other Twitter users. Or perhaps you want to keep an increased level of privacy around your account. Well, this article, hopefully, will tell you how you can keep yourself safe on Twitter! Now, why do we even need to consider Twitter safety? Well, perhaps you want to keep your activity away from the public eye. Perhaps you wish to keep yourself safe from possible predators or other ominous folks. What are some ways that you can protect your tweets and privacy? Protect Your Tweets – You don’t have to have your tweets open to the public. There is a built in feature in your Twitter settings that lets you make them private. The only way people can read your tweets is to be approved to follow you. This not only protects what you say but also who can read your tweets. This is the biggest step! Watch What You Tweet – This rule applies to anything you do online. With the increase in Twitter usage, it seems easier and easier to just post anything. Yet, that is exactly what you do not want to do! Even if you have protected your tweets, do you want them to know about where you exactly live, or where you will be at an exact time? It is always better to play it safe! Use The Block Function – Do you have some shady characters that are following you that you really don’t want to see what you write? If you’re wary of certain followers, you can safely block them. This isn’t a sure-fire way of keeping people away from your tweets, but it can help you manage trouble-users. Remember Your Audience – Even if you have protected your tweets, there is the potential that someone will re-tweet you. With that in mind, any of your tweets could potentially be made public. Therefore, if you’re going to tweet something, make sure that it is something you wouldn’t mind someone in the public seeing. This goes in line with point #2, but it still is different. In the end, common sense is what wins out with Twitter. Make sure that you’re always tweeting with your full thinking faculties. Otherwise, you may find yourself embarrassed, frustrated, or worse. It’s quite possible that I missed some options for privacy protection. If I have, please leave a comment! As I stated at the beginning, I’d be willing to post guest articles as well, should anyone want to write additional material. I think this is a blog worthy of a little trip down memory lane. All of this will take us on a cruise through the history of Instant Messaging. Instant message has its roots before the days of the modern internet. Some types were peer-to-peer, others had people connect to a central server or network. IRC is one of those types, and it is something that is still quite popular in the interwebs today. As computers became more ‘flashy‘ and graphical user interfaces (GUI) came on the scene, some of the more popular ones that we all know and love (or at least know) came about. These include ICQ and AOL Instant Messenger. Once AOL’s hit the web, other branded IMs came up. MSN, YIM, and a few other three lettered IMs that probably came up, too. Well, each of those offer a service that allows you to chat with one or more people. They send a message, you respond. It doesn’t get any easier to explain than that! I know that I am guilty of using Twitter for IM-type purposes. All you need is a Twitter app and you may as well tell yourself you’re using an IM app. And, before you even know it, you’re trapped. It all starts with someone posting a very interesting link about images from the moon. Before you know it, you and them are chatting back and forth, sending each other @replies without a care in the world. This seems to be the habit of more and more people. Have you seen this yourself? Have you checked Twitter, only to find that the past twelve minutes worth of tweets have been between two or three people, all replying to each other in rapid fire? Replies aren’t private – Just because you thought it would be cool to send a message to @BrentSpiner doesn’t mean that only they will se it. So, while you may think it’s cool to start messaging your friends, remember what you put in those messages. If it’s private data, you probably shouldn’t post it on Twitter at all, especially a reply. API Limits – No matter how fast you want your friends’ updates, you’re still limited. Twitter has a limit and, unless you want to sit on their web page and constantly refresh it, you won’t be getting true real time, or instant, messages. Does Twitter have the potential to eventually be an IM service? It’s possible. It would take some changes on their set up to allow for it, but it could be done. Will it be done, though, is the question. Their current setup seems to be popular enough as is, so major changes would probably not be in their best interest. Now, that said, Twitter is still a very useful tool for pushing out information to people. After all, it is called a micro-blogging platform for a reason. Are there ways you can make Twitter more useful? I’ll be writing about that coming up soon. What do you think? Does Twitter serve as your second IM? How do you use Twitter? Leave your comments below!